After spending over $1 trillion to develop the F-35 Joint Strike Fighter, the US Air Force is about to spend another $500 million to upgrade installations at Eielson Air Force Base to prepare for the aircraft's arrival. The controversial fighter jet has undergone a number of setbacks throughout its development. From cyberattack vulnerabilities to major issues with the plane’s propulsion system, it has taken over $1 trillion to bring just a handful of the new F-35s to flight-readiness. 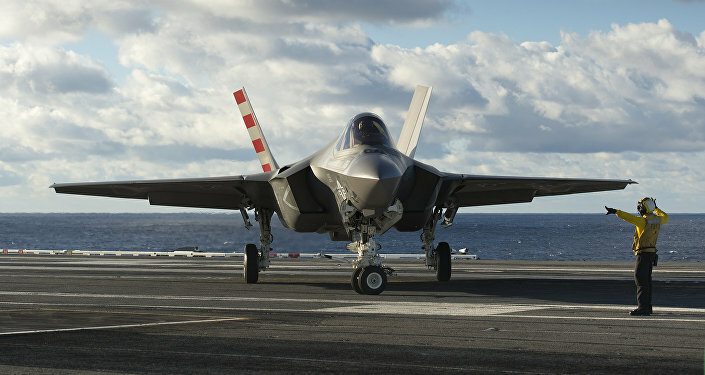 But as the first fighters prepare to enter service, the Pentagon must brace for a new round of expenses. On Monday, the US Air Force announced that Eielson Air Force Base in Alaska had been "selected as the new home for the Air Force’s first operational overseas F-35A Lightning IIs." The base will receive two squadrons of the fighter jets in 2020, a force equaling 54 F-35s. That gives the air base less than five years to upgrade its facilities to accommodate the new aircraft. Given that Eielson was chosen in part out of cost considerations, it’s surprising that it will take an estimated $500 million to renovate the facility. Most of that money will go toward the construction of new hangars, but more will be spent on new "recreational facilities" to accommodate increased personnel. "Regardless of whether it ends up being a brewery or something else, with the additional population here, we’re going to be looking to bring other quality-of-life initiatives down here," Col. Mike Winkler, 354th Wing Commander, told the Fairbanks Daily News-Miner. This year’s budget allocates $37 million for the projects, while next year Eielson will spend $296 million on construction. Another $200 million will be spent in fiscal year 2018. As the Air Force prepares for its first squadrons, four F-35s of the US Navy and US Marine Corps are conducting a closely-watched air show tour across the United States and the United Kingdom. The US circuit is meant to boost the beleaguered aircraft’s reputation among the American public. The two air shows in England serve a very different purpose. "That airplane is going to make what we do from the air and across the board – it will in itself help" to boost the policy of deterrence, said Gen. Frank Gorenc, NATO commander and head of US Air Forces in Europe, according to Defense News. While he never mentions Russia by name, Gorenc’s history of warning of Russian “aggression” makes it hard to overlook which nation the F-35s are meant to deter. In 2005, Eielson Air Base was placed on a base realignment and closure list. Given Alaska’s geostrategic importance, it’s possible that the decision to station the Pentagon’s most state-of-the-art weapon at a rundown military installation is also meant as a deterrent to the neighbor across the Bering Strait.